Uh, oh. I did it again. Fruity Foooood!! I just can’t stop. I don’t really want to so I guess it doesn’t matter. I also can’t stop thinking about chocolate covered potato chips, but those don’t really matter either (they do. I just tell myself they don’t so I don’t want them so bad. It’s not working). Anyhoo, this is good. Chicken? Good. 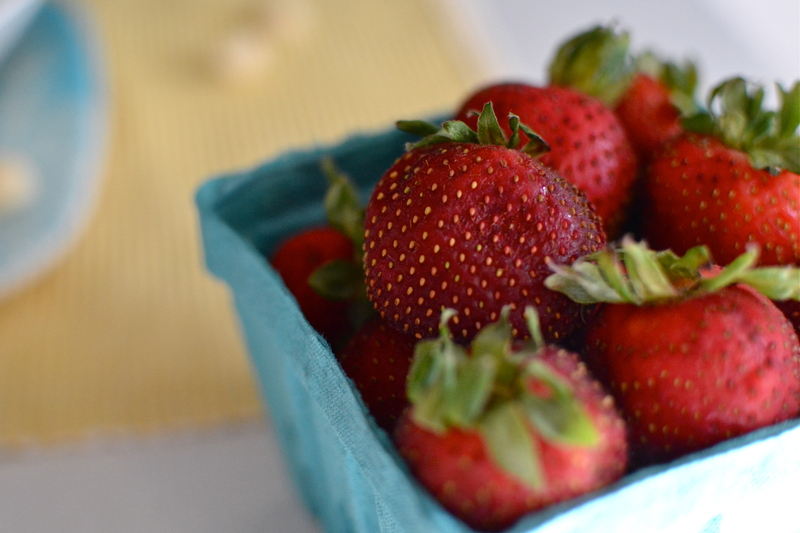 Strawberries? Good. Macadamia nuts? Gooooood. Throw them all together and it becomes a good party. A good, tasty, healthy party. I love those kind of parties. 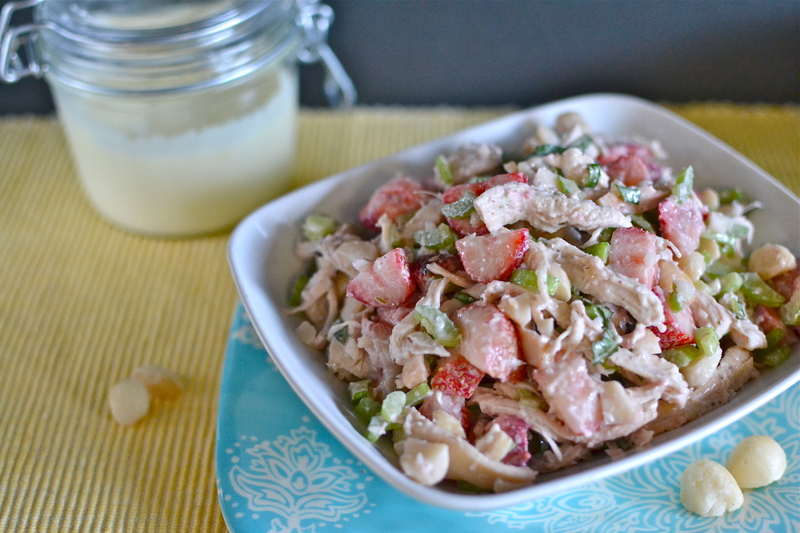 I do know that making homemade mayo isn’t as daunting as it seems, and that when you make some you should also make this chicken salad. ‘Cause it’s good. Preheat oven to 350. Place chicken breasts on sheet tray, drizzle will oil and a pinch of salt and pepper. Bake for about 35 minutes until cooked through. Remove from oven and let cool. 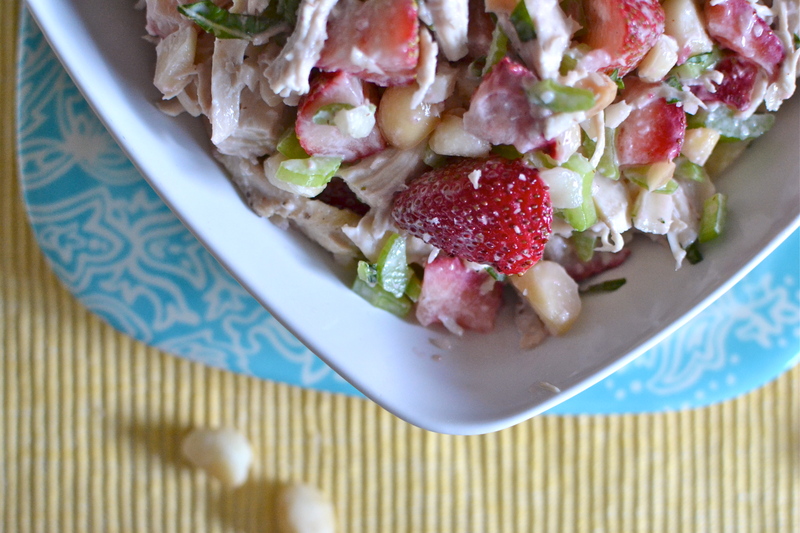 In a large bowl shred chicken. 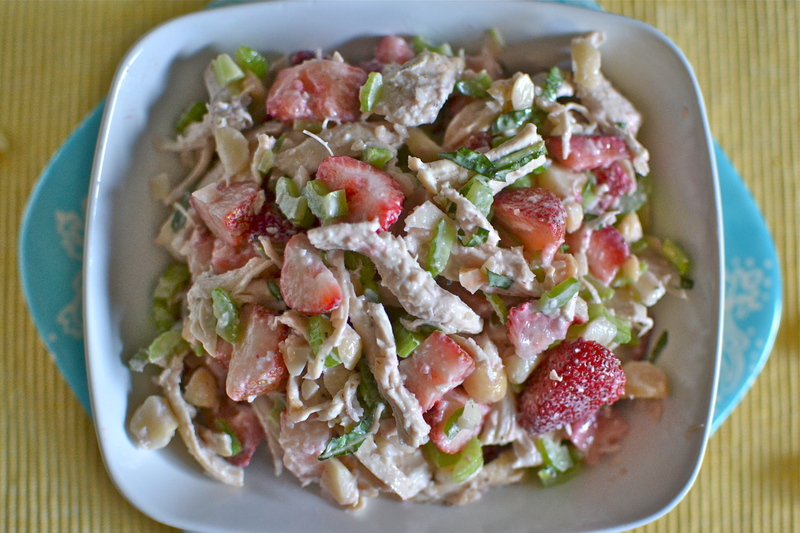 Add strawberries, nuts, celery, basil, mayo, lemon juice, and a pinch of salt and pepper. Gently stir until combined. Eat! Can I come to your party? Wow, what an awesome combination. This must taste heavenly with those macadamia nuts in there. I will be trying this!! Looks amazing!! I’ll have to make this. What kind of oil did you use for the mayo? Thanks 🙂 I used macadamia nut oil, but a mild evoo also works good ! Nope, not mayo free. I prefer to use homemade mayo instead of store bought! 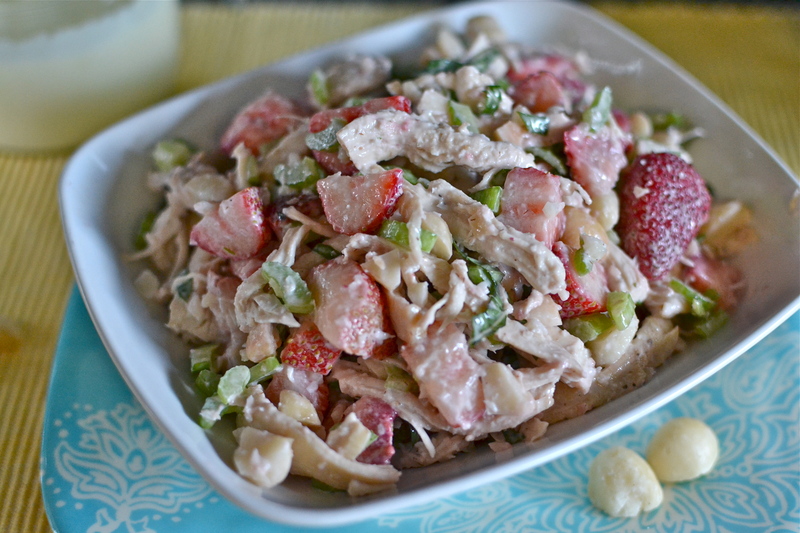 Pingback: Strawberry & Macadamia Nut Chicken Salad - Paleo Chicken Recipes - Sharing New Recipes Daily! Wonderful! Subbed slivered almonds for the macadamia because that’s what I had. Came out perfectly divine! Thanks so!